This envelope was probably posted in India in November 1950. 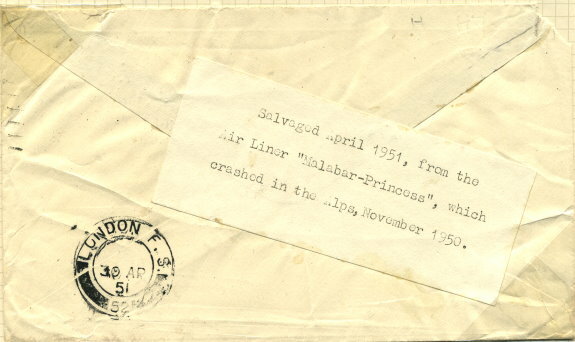 Addressed to England, it was put aboard an Air India Constellation plane, “Malabar Princess”, VT-CQP for the journey from Bombay to London. The plane crashed near the summit of Mont Blanc on 3rd November 1950, killing all those on board. A rescue party recovered one bag of mail soon after the crash. This item was recovered when several more mail bags were recovered in April 1951. This and other rescued mail received the typewritten note attached to the reverse of the item. The London Foreign service postmark was applied on receipt in England on 30th April 1951, almost 6 months after the crash. Of interest was the discovery of a further bag of mail at the bottom of the melting Bossons Glacier nearly 28 years after the plane crashed.